Here are 5 tips on getting a free cabin upgrade for your cruise vacation. it's always worth a try so you can have to best views at sea and better stateroom features than the lower cabin. Cruise ships are well known as floating resorts, complete with gourmet restaurants, world-class entertainment, luxurious spas, innovative fitness centers and more. When you are expecting a stellar experience, however, it can be quite a disappointment to discover that your cabin may feel far from first class. 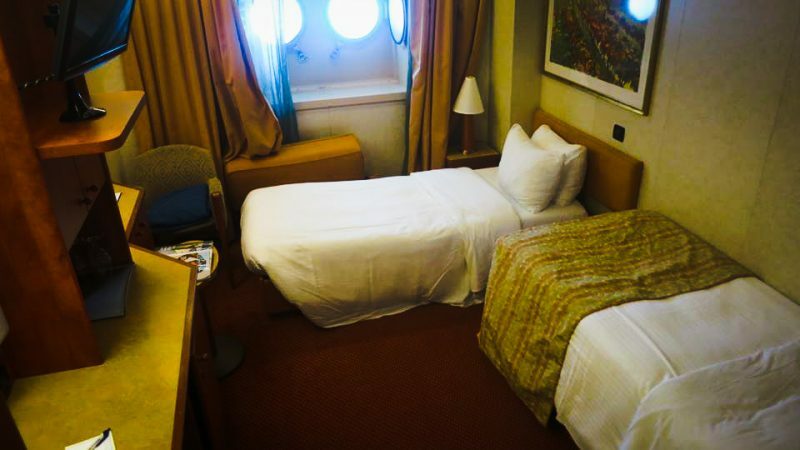 While most cruise ships have several cabin classes available and every line’s cabins are slightly different, less expensive cabins may seem cupboard-sized with very little floor space, cramped closets, generic furnishings and microscopic bathrooms. If you can score a free cabin upgrade, however, you can enjoy the larger space, finer amenities and greater luxury of a higher class cabin. But how can you get one without paying out high-class bucks for the privilege? The more loyal you are to a single cruise line, the more recognition you will build up as a past passenger and the easier it will be to be considered for a free cabin upgrade. As a past passenger, you will also have access to exclusive deals that may involve built-in upgrades, such as paying for an oceanview cabin but the sale automatically upgrades you to a balcony for no extra charge. 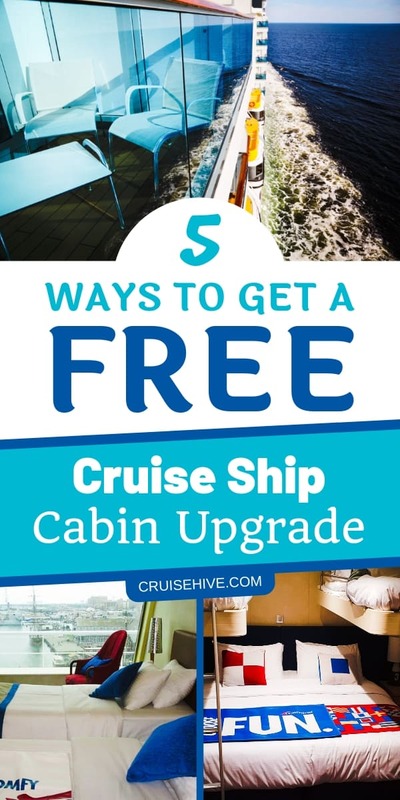 When the cruise line may be shuffling cabins about in the days prior to sailing, booked passengers with the greatest amount of loyalty are also more likely to get surprise free upgrades first. Get a cruise ship cabin door organizer to help solve limited space on the ship. While it can be easy to book your own cruise through different anonymous travel sites or directly with cruise lines, it certainly pays to work with an experienced travel agent if you’re interested in free cabin upgrades. Travel agents often have insights and access to deals not known to the general public, and they can negotiate upgrades much more effectively – often with no cost to their clients. A travel agent can also help you book a less expensive sailing or be part of a group rate that can amount to even more savings than a direct upgrade. During the times of year when cruises are less popular – often right after the first of the year or after busy holidays – not only are rates lower, but upgrades are also more possible because ships are not sold out as frequently. If you booked your cabin early, you may be upgraded for free closer to the sailing date as the cruise line opts to open up more inexpensive cabins to encourage more sales. Because you were already booked, you’ll be first in line to be upgraded to a more expensive type of cabin at no charge. If you’ve opted for a “guarantee” type of cabin, you may find yourself upgraded for free. Because you did not select a specific cabin with your booking, the cruise line can be more flexible with moving you to a different cabin, including upgrading to a different cabin class, as more sales are made and more cabins are booked. Because many ships have several classes of cabin within the same type, these upgrades can happen more often – for example, you may have booked a guarantee oceanview cabin, which could range from the lowest obstructed porthole view to a far more luxurious aft-facing cabin with taller windows. Both are oceanview cabins, but one is significantly nicer than the other, and it will be nicer still if you’re given the better cabin for your lower “guarantee” price. It never hurts to ask for a free cabin upgrade, and you just might be surprised at the answer. Be friendly and polite when you call the cruise line or your travel agent to inquire about upgrades, and let them know if you have any particular reason for asking, such as celebrating a special occasion. If you keep informed about the prices for cabins on your cruise after you’ve booked, you can also ask about free upgrades if prices for higher cabin classes have been reduced. Because those more luxurious cabins are now priced similar to what you paid, you may be upgraded for no extra charge. It is nice to dream about free cruise ship cabin upgrades, but keep those dreams realistic. Completely free, spontaneous upgrades are relatively rare, and there isn’t always any easily deciphered reason why some upgrades happen while others don’t. Many upgrades are also not quite as spectacular as they may seem, and it may be that the two cabins are indistinguishable from one another, but their positions in the ship differ. Furthermore, it is also rare – nearly unheard of – to be upgraded multiple tiers, such as going from a basic interior cabin to an elite balcony completely for free. 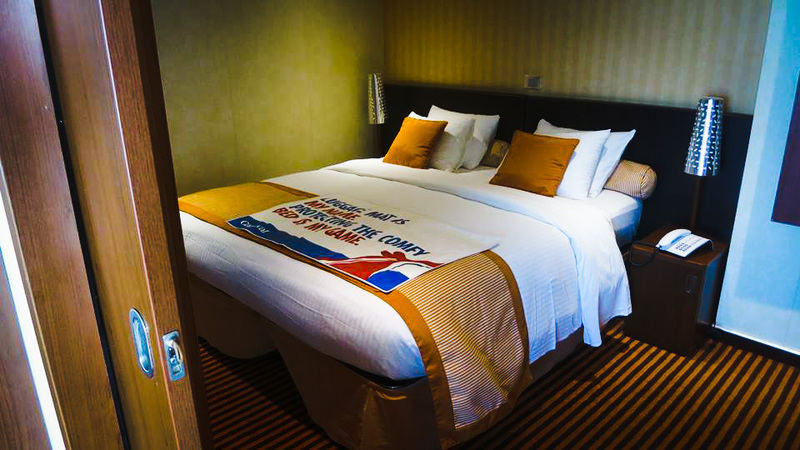 The best option for securing a free cruise ship cabin upgrade is to purchase whatever cabin you will feel comfortable in, and then hoping for the best with regards to upgrades. If you get one, you’ll be thrilled, but if you don’t, you’ll still have a great cruise in a cabin you’re happy to have. It's time to get creative by decorating your stateroom door during your cruise vacation. Follow this guide which includes cabin decoration ideas and what you can and can't do.